Anybody know the current count of breweries in the state? Five years ago it was a relatively static number, fluctuating by maybe three or four a year. When we started this website two years ago we knew there were just over a hundred. But now it’s difficult to keep track. Depending on the criteria used for what’s considered a brewery, brewpub, or brew production facility, the number hovers between 130 to 150. Two things have stayed the same though: Colorado Craft Beer is delicious, and Colorado Brewers are leading the industry. We can always count on dropping into any of our favorite Rocky Mountain breweries to find a delicious beer, either a familiar draught, or a new and inventive pint. That statement has never been more true than on a recent trip back from Wyoming. While Odell is bursting at the seam, they’re continuing to produce incredible beer. I always love the 6 offerings on the Co-Pilot tray, and on this recent visit I hit the jackpot: three of my favorites (Double Pils, Myrcenary, Mountain Standard) interwoven with some great seasonals that I was far less familiar with, but loved immediately (Spring Creek, Celastrina, Wooden Cow). I’m looking forward to a return visit in November, especially to see the progress on their expanded and beautified outdoor sitting area. Whether it’s snowing, sunny, or both, I’m enjoying my co-pilot tray in this incredible new beer garden. So join me there, or head out to your old familiar, favorite spot, and let us know what you’re enjoying and drinking. 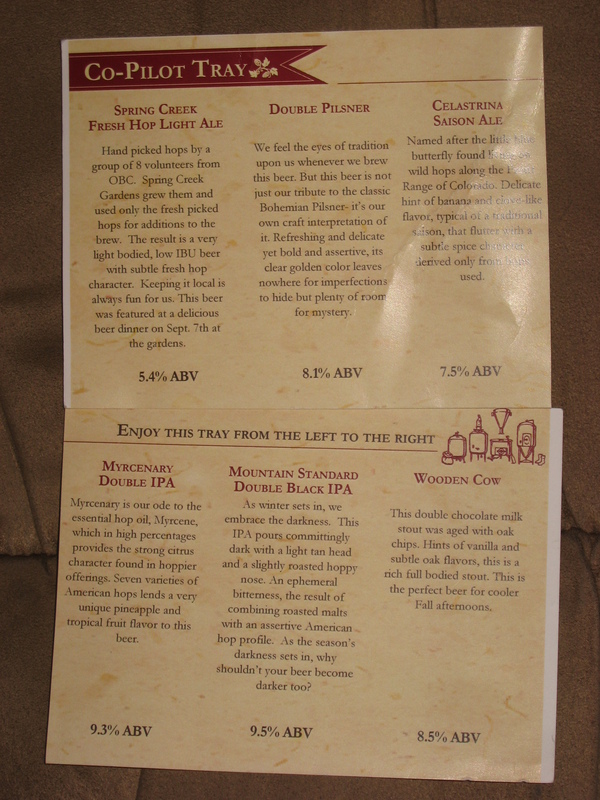 This entry was posted in Beautiful Breweries, Craft Beer Adventures and tagged Colorado Beer, Colorado Craft Beer, Fort Collins Beer, Odell Brewing Company.